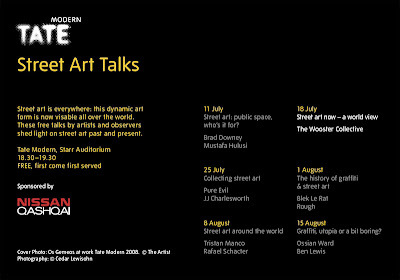 The second of the Tate Moderns series of Street Art Talks take place this evening Friday 18th July. Street Art Now- A world view will see New York based, Marc and Sara Schiller from The Wooster Collective give an insight into the subject and explain how they see the future of the genre evolving. The Wooster Collective is one of the most important websites for the dissemination of street art around the world.